'In the end of 2001, Herege was formed with Dennis de Lima (vocals), Rodrigo Dantas (bass), Maurício Velasco (drums) and Selvino Girardi (guitars) and the proposal of playing some covers of 70' and 80' bands like Judas Priest, Motörhead, Manowar and Iron Maiden. In the same year Selvino left and in 2002 the band decided to start writing their own songs and also had some line-up changes, which ended when Mateus Luft (guitars) joined the band. 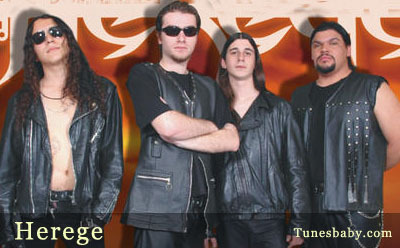 In 2003 Herege released the first demo, titled 'Rise of the Fair, Fall of the Church', with two songs. This demo received a great response, even with a small promotion, made through a few concerts in the first semester of 2004. In July of 2004 the band recorded their second demo, titled Metal World, with the tracks: 'Blind Devotion', 'Limit', 'Metal World' and a cover of 'Metal Gods' (Judas Priest). After finishing the recordings of the second demo, Mateus left the band, being replaced by two guitar players: Dalton Castro and Rui Pedroso. This second recording had a more intense promotion, with lots of concerts in Brazil for a year, including a concert with the thrash metal legend Atomica. During the second semester of 2005, Herege recorded the third demo, 'Bang Your Heads', containing the songs 'Fall of the Church/Die By My Hands', 'Bang Your Heads' and 'Empty Minds', which was released in 2006 as EP with the songs 'Call Me Herege' and 'Flag of the Metal' and live videos recorded at Expo Ijuí as bonus. Actually Herege is composing new songs which will be part of their first full length, and meanwhile are still promoting the EP, now with just one guitar, since Rui Pedroso left the band.